When it comes to fast food burgers in Southern California, In-N-Out has always been king (at least in my book). So when the Five Guys Burgers and Fries franchise made their way west, I was intrigued. Could this burger joint be better than my beloved In-N-Out? President Obama is clearly a fan of Five Guys so clearly it must be pretty good. In-N-Out originated in Baldwin Park, California in 1948 and started out as a small drive-through burger joint offering hamburgers, cheeseburgers, and double-doubles (that’s two hamburger patties for those not in the know). You can order fries, milkshakes, soft drinks, and secret “off the menu” items such as a grilled cheese but the menu has remained the same for years. In-N-Out does not offer other burger toppings such as mushroom, bacon, and jalapeno to name a few and you can only get your hands on these burgers if you live on the west coast (although they are expanding to other mid-west states). In-N-Out is NOT a franchise and has no plans to do so. 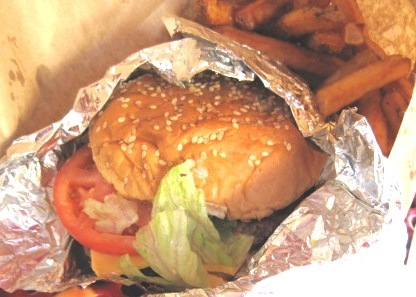 Five Guys Burgers and Fries originated in Arlington, Virginia in 1986. Until 2001, Five Guys just had select restaurants in the Washington D.C. metro area until they began to franchise in 2002 in Virginia and Maryland. By 2003, the franchise had expanded to states across the U.S. Like In-N-Out they offer hamburgers, cheeseburgers and french fries but also offer hot dogs and endless toppings for their burgers including peppers, BBQ sauce and pickle relish. They don’t have a drive through and don’t stay open as late as In-N-Out. So onto the taste test. Before we headed out I checked the nutritional stats online and was disappointed to discover that Five Guys uses SOY in their hamburger buns. Since soy is one of my many food allergies, the burger was now a no go. -1 for Five Guys right off the bat. We arrived and there was a massive line out the door. 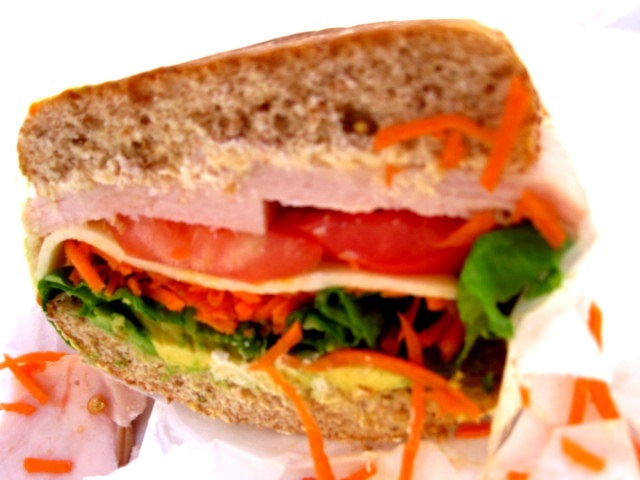 I went to get a table and sat there enjoying my soy-free Whole Foods sandwich while the Englishman ordered. I did notice that while waiting in line the restaurant staff was handing out peanuts to everyone to snack on. Apparently peanuts have been a Five Guys’ tradition since they opened – offering people peanuts to eat while they wait and cooking their fries in peanut oil. Nice idea, but if you are a peanut allergy sufferer you basically cannot go anywhere near the restaurant since peanuts are pretty much everywhere. While waiting for his order to be called the Englishman informed me that the inside of the restaurant was covered with different quotes from various media outlets saying how great Five Guys was. I didn’t think much of it, but he was turned off by the fact that it seemed they were overly stating how great they were (something In-N-Out doesn’t do). Finally it was time for the food. The Englishman’s cheeseburger came with two patties instead of one (which he liked), and piping hot fries sprinkled with salt. Since I was passing on the burger I opted for some of the fries which were very good, but also very salty. So what put In-N-Out over the edge? Overall the Englishman thought the meat at In-N-Out tasted better, he likes In-N-Out’s secret sauce, and felt the burger overall was significantly less greasy than Five Guys. But he was quick to caveat that if you had a lot of adult beverages on any given evening then Five Guys might be the perfect late-night or next day food. In regards to the fries we both agreed that they were a bit too salty and almost overdone. I LOVE In-N-Out’s fries so I knew this would be a tough one to beat. Plus, In-N-Out is a bit cheaper than Five Guys so that is always a bonus. The end verdict? While the Englishman did enjoy the greasiness of Five Guys, he doesn’t really plan to return anytime soon, especially since we have 2-3 In-N-Outs close to where we live. And as for me? If Five Guys got it together and stopped putting soy in their hamburger buns, well I might give it a shot then too. And so it remains – In-N-Out is the fast food burger to beat. Can it be done? As of right now the Englishman and I say no, but Five Guys did put up a good fight. Well-played, Five Guys, well-played. 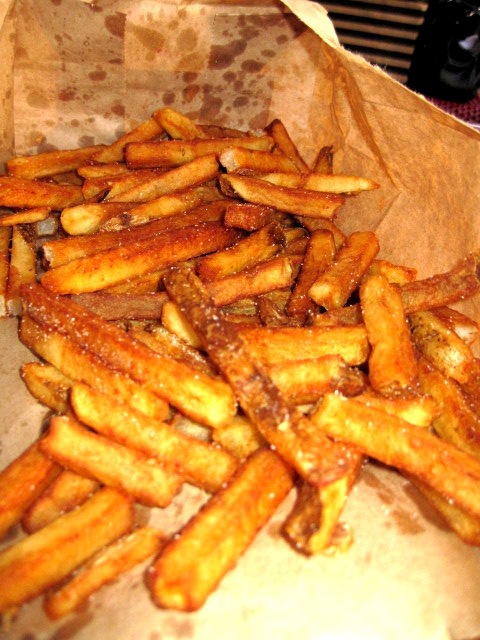 This entry was posted in Food Allergies, Good Eats, Orange County, Uncategorized and tagged burger in OC, fast food, five guys burger and fries, in n out, in n out burger on July 31, 2011 by allie@sweetpotatobites. I don’t know if it is this location, but out here in the SF/Bay Area at every In-N-Out I’ve tried (3 of them) has had soy in them. In 2010 I regularly ate In-N-Out without any allergic reaction. Since I started getting a low reaction from In-N-Out I’ve tried everything. I tried the no bun version (low carb), without frys, without cheese, without the spread, and different In-N-Outs. I even tried the ‘flying dutchman’ which is just meat and cheese and nothing else and still had a reaction. This only leads me to believe that they are using vegetable oil on their grills when cooking the meat. I do not know if this is true but I’ve never had an allergic reaction from a place claiming to not use soy before. Also, the reactions are new to 2011, so it might have started after you made your post. Also, when I contacted In-N-Out about the issue they refused to let me know if their food had soybean oil in it or not. That’s such a bummer to hear about In-N-Out! I haven’t been to them in awhile (at least 6 months) but I’m definitely going to look into this. I ate at them a bunch last year without any allergic reaction as well, but now I am wondering if they are using a different cooking oil like you said. Thanks for letting me know-always better to be safe than sorry!